They’re to take place this month and next. 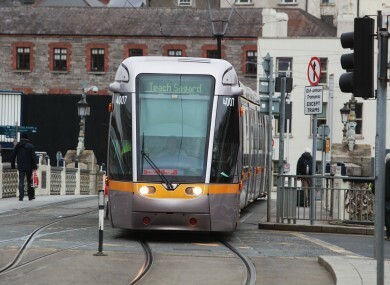 LUAS DRIVERS HAVE announced six further strike days in their ongoing pay dispute with management. Their union Siptu has confirmed that the actions will include five 24-hour strikes over this month and next and a further four-hour stoppage. The full day strikes will take place on 28 April and next month on 4, 13, 20, 27 May. The four-hour stoppage will take place on 26 May and will be between 3-7pm. This escalation comes in addition to the two strike days already planned for later this month on 23 and 24 April. Siptu spokesperson Owen Reidy is proceeding with further strike action on the tram service in the absence of an agreement in the ongoing dispute. “In the absence of any agreement or any other kind of process the workers have no option but to continue with their campaign of industrial action,” he said this evening. We have given more than the required notice in order to give as much time as possible to find a resolution and the company to sit down and be flexible. Recent opinion polls have shown that an overwhelming majority of people do not support the striking workers but Reidy says that this is to be expected in transport disputes. I don’t think that any public transport dispute garners much public support and it’s clear that any support that’s there is in the small minority. I think that’s known and understood by the workers and I think they are aware of that so I don’t think that’s an issue. Email “Luas drivers have announced six more strike days”. Feedback on “Luas drivers have announced six more strike days”.